Cut bread in half lengthwise. Hollow out top and bottom halves, leaving a 1/2-inch-thick shell. Reserve torn bread for another use. Sprinkle cheese over bottom of bread. Toss balsamic vinegar with spinach. 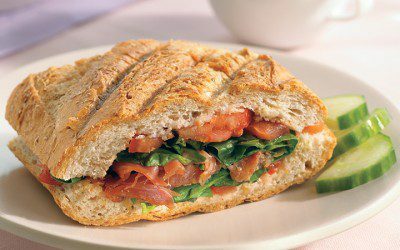 Top bread evenly with tomatoes, prosciutto, basil, rosemary, and spinach. Cover with top half of bread. Cut filled loaf crosswise into 4 equal pieces. Coat grill pan with nonstick cooking spray and heat over medium heat. Add sandwiches to pan. Place a cast-iron or other heavy skillet on top of sandwiches; press gently to flatten sandwiches. Cook 3 minutes, turn and cook 2 minutes or until bread is toasted. Cook’s Tip: These are delicious served as cold (uncooked) sandwiches, as well. Exchanges per serving: 1 1/2 Bread/Starch, 2 Meat.